Never-before-collected essays, talks, and interviews with the luminaries of Beat literature. 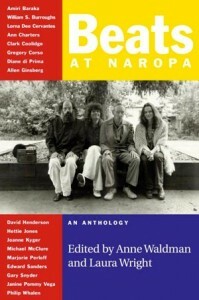 Amassed from the riches of the Naropa University audio archives, this collection offers an exciting new look at the Beats—whose influence lives on in the art and politics of our time. In this often spontaneous, conversational book, readers are introduced to the hard truths behind being a Beat woman, the haunting accuracy of William Burroughs’s world-view, the passion and energy of Allen Ginsberg and Anne Waldman, Jack Kerouac’s unexpected musicality, Diane DiPrima’s foray into small press publishing, Michael McClure’s account of the famous first reading of “Howl,” and, most of all, the inspirations behind America’s most provocative and prescient thinkers.